Did I ever tell you about the run we did a few weeks ago because Ben’s nephew cracked the wobblies at his uncle for not running anything with him? If I didn’t, I am sorry but it was pretty hilarious. If I have sorry, you are going to sit through the story again. Ben decided to pull a group of us together to run his nephew, Hayden (sp?) through Motherlode and sadly Michael was not up to doing another mythic. No one else was responding and so, I stupidly offered to heal. From my memory it was Me healing, Drew tanking, Ben, Hayden and poor Simon. We did motherlode as it is easiest to get to and it was horrific. I didn’t have any mouseover macros set up, I had no experience healing as a druid and even less just healing in general. Hayden kept pulling extra mobs on his way back to the group after dying and Ben kept telling him off until he quietly said “well, I haven’t ever been here before!” Oh. Oops. Sorry love. It was so hilarious. The entire run was just a mess of everyone pulling threat and extra mobs and me trying to heal through it with all buttons that look green!!! Thankfully that ended early as the server decided to do a restart and we were all put out of our misery. So if that wasn’t enough of a horrid experience I offered to heal again just recently because we wanted to do a run but Michael was again, unavailable. Noticing a theme here?? What is our heals doing!??! I believe he was going for a run…I mean…come on… WoW > Exercise? LOL. It was well worth it though because we got a pet out of it!! It was the entire reason we chose King’s rest; to get the pet – since I was going to heal we figured it wouldn’t be too hard on me. I only managed to kill people a few times as I set up my mouseovers before we went in which was so much better. I have so much respect for healers because I have no idea how you heal and move at the same time. I died on the Tribe of Elder boss after we killed the first one, so Ben laid his hands on Drew at one point and they managed to kill the boss without me. I couldn’t cast anything in the embalmer room because those stupid slimes targeted me the entire time. I was – once again – cursing about them violently. They don’t target random – they target me. Only. Like the last boss in Motherlode – it is me – every single time with the missile. Every time. I have no idea how to heal when I literally spend the entire time moving. OMG I was angry. I really do not understand how healers have the calmness of mind to do the job. I think raid healing would be much easier because you are not the only person there but 5 mans. It is like a stress level I cannot deal with, the only time I felt ok was when Drew had all the aggro and was the only taking actual damage, but the second someone else took aggro it was OMGWTFHEALZ!!!!!!! Horrid. HORRID!! I also refuse to create a healing set when I am still trying to get a tanking set and keep my balance set up to date. Too hard. TOO HARD BLIZZARD!!! So how do we get the pet? In the last boss room of King’s Rest, there are 2 large sarcophagi at the back of the room (left and right) and a far distance apart. You need to have two people ready to stand on the little triangle/ shape on the ground in front of the sarcophagi just after you pull the boss – one left and one right. The triangle shape will have no interaction. Once you pull the boss, you need to wait for some tiny little fairy lights to appear around the triangle on the ground. When you see the lights the two people stand on their own side and you have to stand there until the sarcophagi starts to shake and rumble. It took about a minute for it to happen with us. So just be patient and have your healer keep the tank alive whilst you wait. You can then kill the boss once you have the rumbling sarcophagi happen. 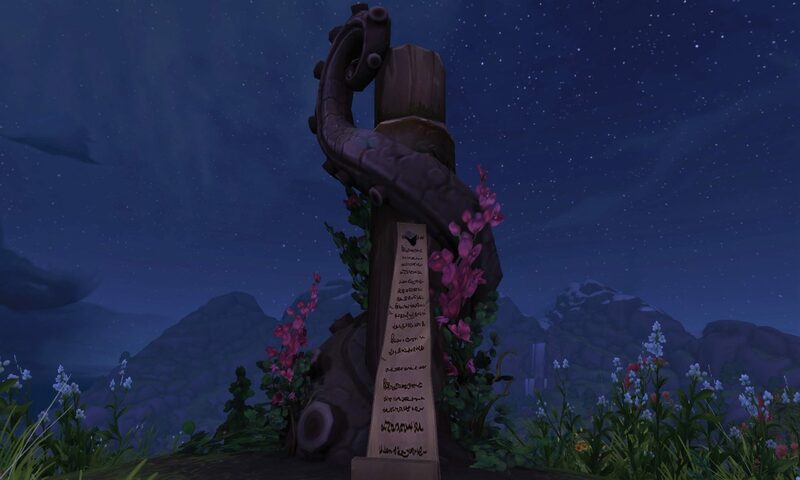 You cannot do it on heroic or keystone. You have to go in on mythic 0 only! Grats on the How to Keep a Mummy achievement! Look how cute he is!?!?! JUST LOOK!!!! That run with Hayden was a comedy of errors and I’m so glad you guys didn’t get angry. The King’s Rest run was pretty good though. I can not ever imagine healing as a thing, it is just far too nerve wracking. I honestly think it requires a calm person to handle it. Calm has never been used to describe me….in any way…. Previous PostPrevious Mythics…you confusing little buggers.